It’s been a wild few weeks in Boston Red Sox-land, with Boston axing Mark Kotsay and his beautiful wife Jamie in favor of Adam LaRoche, the steroid revelations about David Ortiz and Manny Ramirez, and the fevered speculation over whether Theo Epstein could — or would — swing a trade for Roy Halladay. The dust is now at least starting to clear (at least, until Michael Vick signs with the Patriots, but that’s another story). Today, Boston gave up on acquiring Roy Halladay, went after Padres 1B Adrian Gonzalez but then gave up on him, too, after Kevin Towers asked for the moon, and ultimately acquired Cleveland’s Victor Martinez (who can play first, catch, and DH) for reliever Justin Masterson and pitching prospect Nick Hagadone, as well as pitcher Bryan Price. This made the newly acquired LaRoche expendable, so Boston swapped him with the Braves for Casey Kotchman. MLBTR said of the Martinez trade, “Gut reaction: nice haul.” From this I presume they meant that the Indians got a nice haul for Martinez (and this before Price was known to be part of the deal) but my reaction was, not so fast. I think this is a great deal for Boston. They get a versatile player in the switch-hitting Martinez, who is still only and beefs up their flailing offense. They deal a sidearm reliever who seems due to be figured out by opposing hitters and a high-ceiling pitching prospect returning from Tommy John surgery. Yes, Hagadone strikes out a ton of batters (11.7 K/9 over parts of three seasons) but he’s only started 23 games. He’s never pitched above the Sally League. And he throws a lot of walks: a 5.0 BB/9 in low-A this year. I know the Red Sox were high on him, but baseball is littered with high-ceiling prospects who just didn’t work out. This deal not only helps the Red Sox this year, but it helps them next year, too, as it will let them kick their dire catching problem down the road if they have to. Price is sort of the mystery-man in this deal: a 6’4″, 210-lb righty who’s been pitching for high-A Salem. He was a 1st round (45th overall) pick in the 2008 draft. He’s 1 and 6 in Salem with a 6.54 ERA, but he also strikes out a lot of hitters. In 8 games for the low-A Greenville Drive, he went 3-2 with a 2.45 ERA, and had a more impressive season in his pro debut last year, where he struck out 43 and walked 10 in 12 games. In the end, despite the urge to pronounce “winners” and “losers” (as Sports Illustrated writers were doing on Twitter within moments of the deadline closing) this may be one of those trades that is a good deal for both teams involved. However, it seems to this observer that the Red Sox managed to buy low on Martinez, who has been slumping, and sell high on Masterson, who got all kinds of good press last season after an impressive MLB debut, but who posted a 5.73 ERA in July. The Kotchman/LaRoche deal is another smart move by Boston. As a Beantowner, I didn’t really understand why Boston dumped Kotsay for LaRoche in the first place. (While LaRoche is a modest offensive upgrade, Kotsay could play outfield and infield, and was solid defensively.) So I’m glad to see the back of LaRoche, and glad to welcome the defensively skilled Casey Kotchman to Boston. A week or so ago, when I was writing about the alleged struggles of Jon Lester for the Metro, Boston ranked 28th in defensive efficiency. Today, they actually rank dead last — 30th. If Kotchman can sub in as needed for the defensively challenged Martinez and allow Kevin Youkilis to slide over to third, that should materially improve Boston’s defense. No, Youk’s -2.2 UZR at third isn’t great, but it’s substantially better than Mike Lowell’s -9.0 rating. Plus, if Big Papi suddenly loses his steroids power stroke again, Lowell can just DH. The way I see it, Boston addressed their two biggest challenges: a struggling offense and an execrable defense. And they did it for a fraction of what Roy Halladay would have cost. So, yes…if I actually ever updated my Twitter feed, I suppose I’d declare them trade deadline winners too. they traded my Masterson!!!! MY Masterson!!! :-( he was so valuable the first half of the season. and so likable. I understand why they had to do it but DAMMIT, why’d it have to be Masty? he was such a good fit on the team. thanks for explaining the 1B for 1B trade too – I didn’t really get it at first. still not sure if I do, since Martinez can cover at 1st as well. thought it would have been better if they could get a guy who could cover 3rd and/or short. (Mark Teahen woulda been nice). Sarah, your Sawx fandom is blurring your vision a bit (the same way that my vision is still blurred at how the Phils “only” gave up Marson, Knapp, Carrasco and Donald for Cliff Lee). I think that the Sawx gave up a lot for VMart, but I do think that it will be a short term win in Boston. Robert, I think that the addition of Bryan Price to the deal makes it a better deal for Cleveland, for sure. But when I saw we’d gotten a 30-year old switch-hitting catcher (who can actually still HIT from time to time) for, initially, a guy in A-ball and a reliever I’ve personally lost faith in, I was not buying the MLBTR line that Cleveland got a “good haul.” As it is now, I would agree that yes, Boston gave up quality to get quality. But neither side got fleeced, and this allows Boston more time to try and get a long-term solution at catcher. There’s been literally no one in the org who can step in full-time for Varitek for ages, which is why it should not surprise you to learn that whenever Varitek suffers a season-ending injury, the Sox have missed the playoffs. And Lyndsay….maybe Nancy Drew Fragile Baldelli = one player who is reasonably healthy? 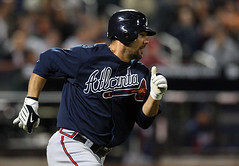 Plus, if someone DOES get hurt, remember, Youk can always play left! Kevin Youkilis is the duct tape of baseball. He can be used to fix ANYTHING.